I just came back after about a year off. My attacking and defending is a little hit and miss. What is your goal, PvP or HD? If HD, use a northern corner base with double walls to the south. HD is more important IMO, as you can get 10 Bronzium crates a day. Yeah probably would be the HD for the fragments and whatever else I can get from them. I have considered the corner and will try it see how it goes. 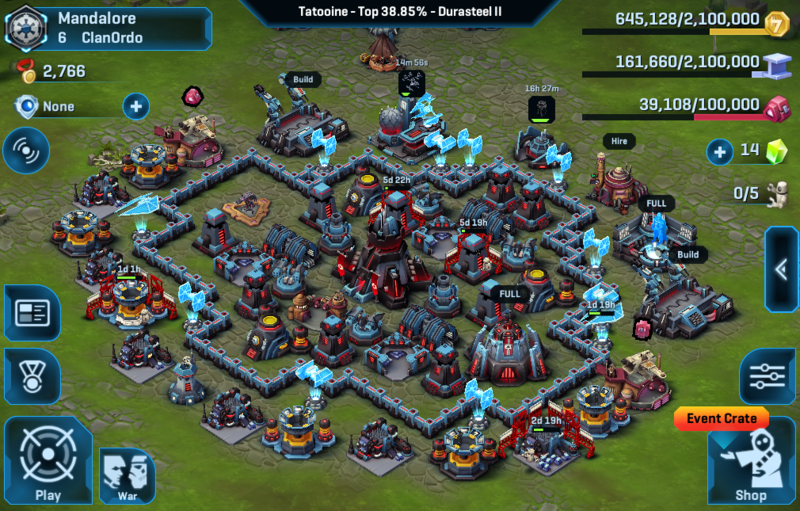 Any recommendations on turret ratios? Like more of a certain type or a balance of them all. DudeMann wrote: Yeah probably would be the HD for the fragments and whatever else I can get from them. I have considered the corner and will try it see how it goes. Any recommendations on turret ratios? Like more of a certain type or a balance of them all. As a HQ 8 you should be running either Full Bursts or 60/40 Bursts / Rockets. I would Swap those Mortars for either Burst or Rocket and of course re-design Base for HD. You also need to keep your SC more closer as it can be easily triggered by attackers and you should change your layout to a north corner base with double layer walls for slowing down HD attackers and as DS mentioned change your mortars to bursts or rockets but bursts are more preferred due to their great 140% damage multiplier against jets. Awesome, thank you guys for the input, have been giving new design a lot of thought. When i get a new set up I'm happy with I will upload new layout.